As I touched on previously in a tale of an epic romance, fungi are master consumers of everything organic. If it's a solid or liquid constructed mostly of carbon and hydrogen atoms, at least a couple of fungi out there can wring energy from the chemical bonds holding it together. In addition to mowing down on living and dead organisms, fungi are known to feast on animal poop. Digestion isn't a perfect process, so its end product, while unpleasant to the senses, isn't devoid of nutrients. Coprophilous (dung-loving) fungi tend to grow on the dung of plant-eating mammals, firing their spores onto nearby vegetation in hopes it will be eaten by these same dung producers. The spores are hardy enough to survive passage through a digestive tract and thus end up in a pile of fresh dung. In other words, a new home with a freshly stocked pantry. Spores 'hatch' within the dung and develop into a network of nutrient-gathering fungal filaments. When the time is right, a spore-releasing fruiting body (what we often call a mushroom) grows out of the dung and the cycle continues. 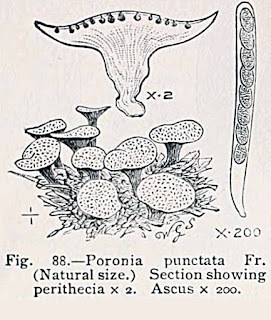 Poronia punctata is sometimes called the nail fungus, as it produces mushrooms that resemble nails hammered most of the way into the pile of dung from which they sprout. I think they look more like golf tees, but to each their own. They've got a sepia thing going on with their dark brown stalks and pale brownish heads (about a cm in diameter) dotted with small dark pores (ostioles). Gel-coated spores are released via these pores from internal structures known as perithecia, which contain cylindrical spore-filled asci. The gel coating likely helps the spores stick to plants after landing on them. P. punctata is a member of the Xylariaceae family, most members of which grow on living or dead plants instead of poop. Check out the similar dark stalk and light top of Xylaria hypoxylon, one of its relatives. Strangely enough, P. punctata seems to prefer horse turds in Europe and cow pies in the US. In grasslands of the Great Plains, the fungus produces mushrooms only after the dung has sat undisturbed and exposed to the elements for at least six months! 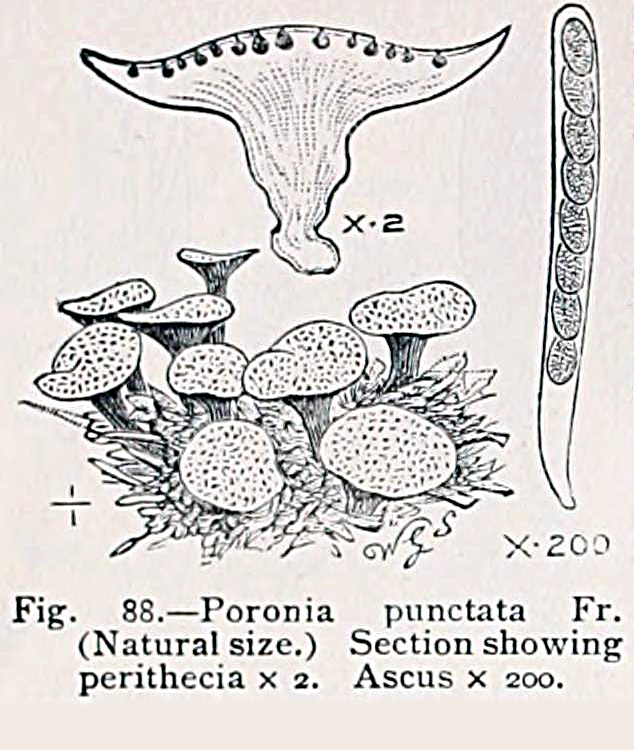 P. punctata is able to inhibit the growth of its fungal competitors (e.g. Ascobolus furfuraceus and Sordaria fimicola), in part through its production of an antifungal compound known as isoepoxydon. This enables P. punctata to hog the nutrients contained within a dung pile and stick to its relatively long development timeline. The fungus also produces compounds called punctatins (aka punctaporonins) that appear to inhibit the growth of bacteria. P. punctata is considered to be one of the least common fungi in Europe, although in the past it was widespread in many countries. The reason for its current rarity appears to be its dependence on horses/ponies/mules grazing in open pastures on natural vegetation. These days, animals tend to be kept indoors and/or are fed a diet that differs from what they'd have if they were just allowed to graze, disrupting the life cycle of the fungus. The fungus is now limited to localities where open pastureland is still grazed by horses and their equine relatives, which include remote parts of Croatia and the New Forest in southern England.